Good morning world! It is 6 a.m. on Tuesday. We arrived in Incheon yesterday evening around 5 p.m. local time. If you're wondering, that is about 4 a.m. EST. With my lack of sleep, I was really tired. Good news is, it was a hassle free customs process. I was looking for money and went to the atm. It was quite interesting as I was trying to figure out how to run the atm and it wanted to know how many won I wanted and I was trying to figure the conversions out. I ended up getting about 50,000 won which was around $48. 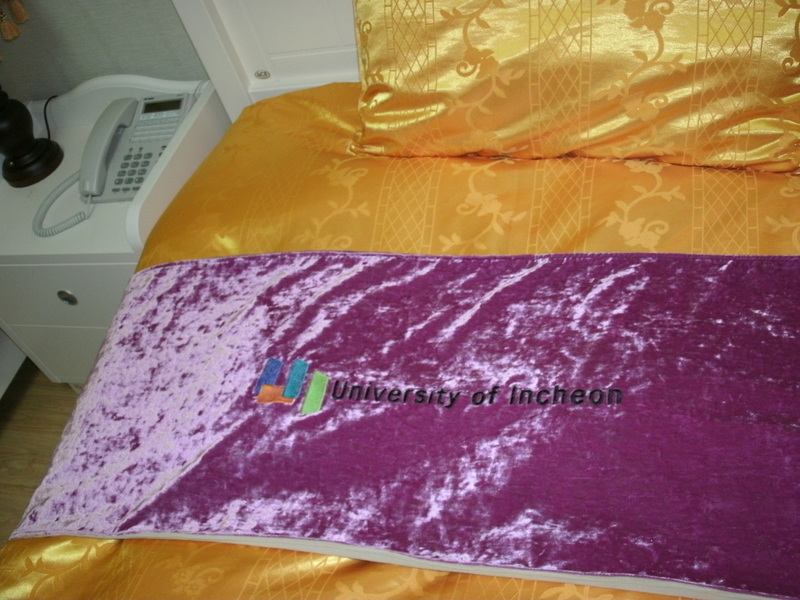 We were picked up the University of Incheon and met our Korean buddies Angela, Angelina and June. Of course we can't be at Incheon without meeting Mr. Choi. I must admit that I didn't really know what to expect when I got here, but was surprised by how much new construction there is around Incheon. I was also surprised by the fact that they are building more land. 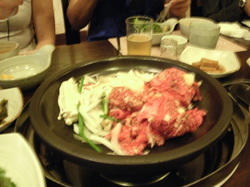 We went to the Bulgogi house for dinner. It's supposed to be a favorite stop for everyone and I understand why. I was extremely impressed by everything. The food was amazing! The one thing I learned was that I will need to figure out how to use these metal chopsticks! The room was really cool. The table was down in the a hole and we sat around it. There were grills in the tables and it was just a fascinating scene over all. We removed our shoes before entering the room. The experience of eating was awesome too. I have learned that you do not pour your own drinks unless it's water. 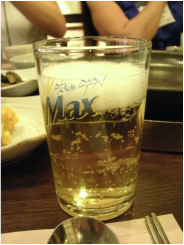 And that Korean beer is pretty good. Personally, I'm more of a bourbon and coke girl, but it was still good. When the food started coming out it just didn't stop coming. 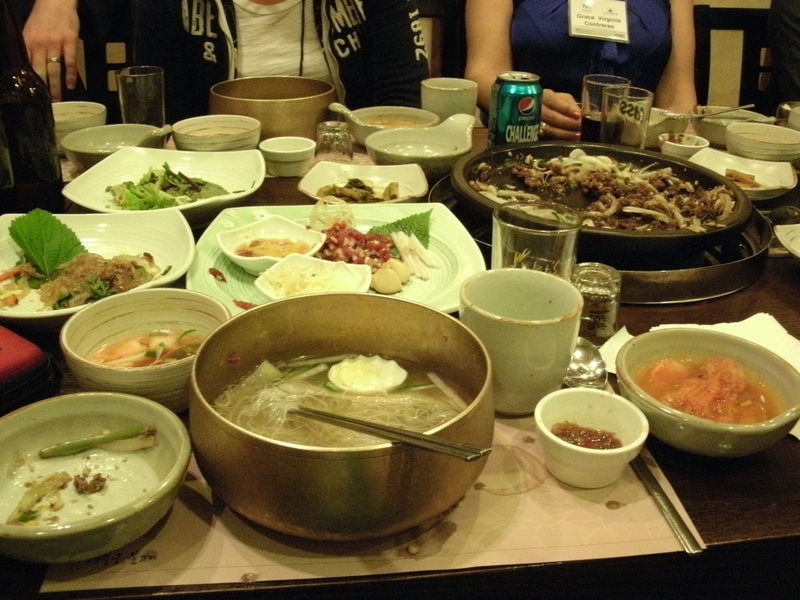 We started with some kimchi soup and a bunch of side dishes, then they brought out the meat. 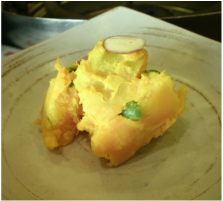 Side dish 1: Some form of squash? 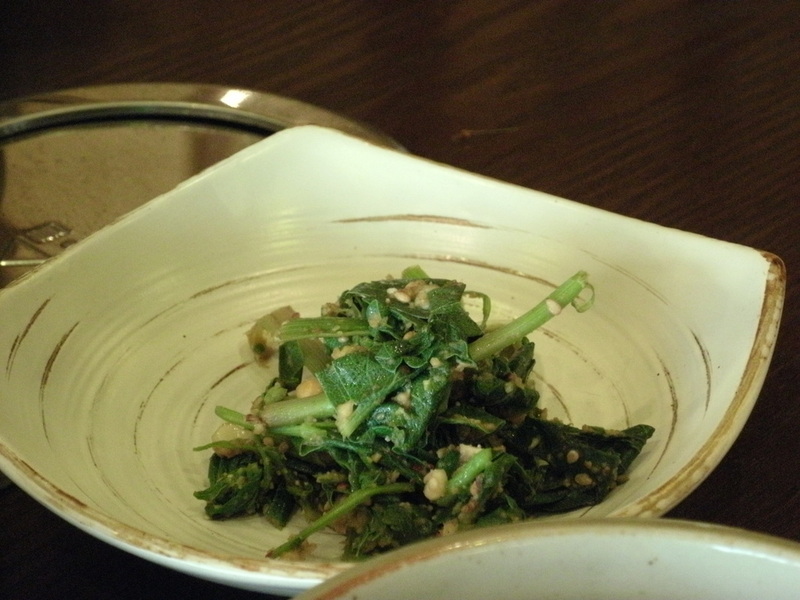 Side dish 3: something about turnip leaves. Sesame seed plant leaves. Had some kick to it and very good. The grills in the middle were filled with beef, mushrooms, garlic, onions and some other stuff. They cooked, we ate. We dipped the cooked meat into some sort of garlic sauce and that was amazing! I will be perfectly happy to keep eating meat in Korea. So I did. They also ordered some form of gourmet dish with beef that was too die for. 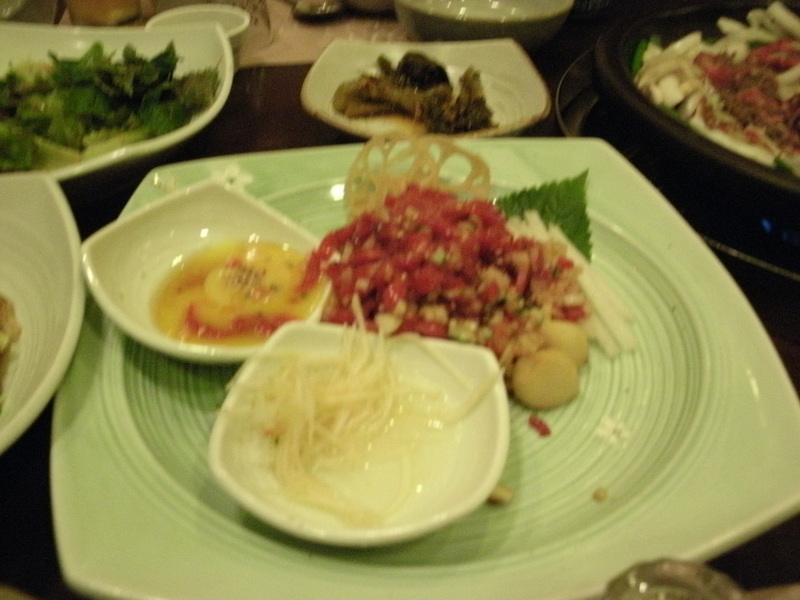 This was a dish of raw beef that you dipped in raw egg and ate with ginseng root. YUM!!!!!!!! I understand why Corbin claimed that as her favorite dish. Finally fishing off our meal, they brought out one more thing. Some sort of raspberry desert drink. They said it was a type of juice. It was very good! As if we weren't full enough already. They brought out some cold noodle soup that was quite a challenge to eat with the metal chopsticks. Ashlin was doing the stab and stir and I was doing a catch and release system. It was like fishing, you don't catch a fish every time you throw your line out. Angelina had to help me break apart these noodles as I was highly confused but thoroughly enjoying the food. After the amazing dinner we were finally able to see the guest house. I was quite impressed. We have a computer, a tv, a fridge, two bathrooms, slippers, a balcony, etc. This is a tricked out place! Our one issue is that we can't figure out how to get the air conditioning working, as it was really hot in here last night. We finally just just off the system and opened the windows. So today started out with me waking up way too early． I woke up at 5：30a.m. It was quite an early morning. Soon enough though I was up and working on this blog. Talked to the parents then went down stairs for breakfast. 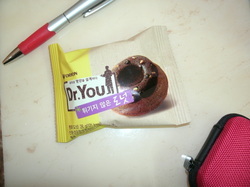 Breakfast consisted of Corn Flakes and this donout (left). They were very good. Next we headed over to the welcome and learned quite a bit about Incheon's history. We were all given a small jewelry box and then sent up to the President's office. He explained about the architecture of the university and the reasons for the specific designs before providing tea and giving us a ball point pen. Finally we went on the tour of the University with our Korean buddies. Today we had Ann, Ann, Chun-chi, June and James. It was a lot of fun exploring the campus (see pics below) I was shocked by so much of it! After our campus trip we went to Wolmi Park. It was full of shops, carnival type rides, fried foods, coffee shops, live entertainment, etc. It was like the state fair. After that we walked through the Korean Immigration museum. It was quite interesting and I probably would have really liked it if I could have understood what I was looking at. Then we went to China town.. That was awesome. I found one of those bird whistles and a fan. :) We got to see the freedom park and the cherry blossoms were still in bloom, it was really pretty! They were having a big festival so there was more live entertainment and they had an aviary. Finally, we went to dinner. Dinner was awesome! It was authentic Chinese food and I don't think I will ever be able to eat our Americanized Chinese food the same way again! 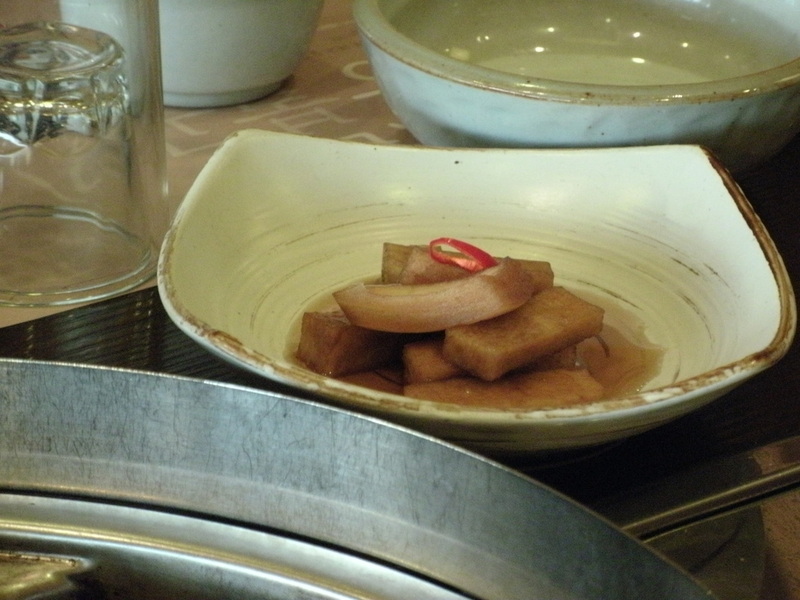 We had pork, chicken, kimchi, radish, turnips, etc. It was all delicious! I was very excited about the food as I've never eaten authentic Chinese before and had been told it was all very sweet. It was sweet, but not like sugar overload either. The day started out unexcitingly. We began with our day with our presentations. Ashlin made me hungry for mac and cheese with her presentation on southern food. And then went to lunch at the faculty lunch room and had a bowl of spicy seafood soup with rice and a few other things. It was all very good. Grace had asked if we could sit in on a class to see how they teach and I think she was refering to an art class but I was quite excited when we entered the science building after lunch. We were taken into a Graduate level class that was talking about medicinal purposes for mushrooms. It was facinating! Granted Josh and I think that he added twenty slides to be the beginning for us because they were all on basic biology concepts. Regardless it was really cool! Then we sat for another hour through the presentation on being a foreigner in Korea by a visiting professor from Texas (SarahAnn Sutter). She has been here two years already and loves it. Then we sat for the presentations by our Korean buddies and those were very interesting. We learned about the culture, the school and the economy. 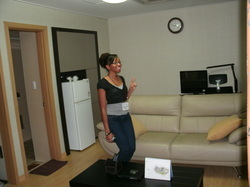 Finally, we headed back to the guest house to prepare for our dinners with Korean families. I was teamed up with Boyoung and was quite excited about that. Today was jeans day! No more facy clothes! We started out at the Incheon City Museum and that was really cool! They had audio devices for us since none of us can read Korean (well, except Boyoung). It was very interesting learning about the Korean history and they had some awesome exibits but the cooler ones didn't let you take pictures so I can't show you those. At the museum shop, I finally bought some stuff, I bought four oragami paper dolls which I will put together when I get back and some sort of green clutch. I'm very excited about it. 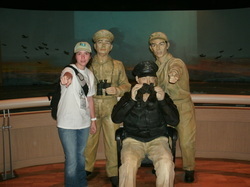 Then we went to the Korean War Memorial Museum. It was an awesome set up. I was quite impressed with the how they did that. It was quite amazing to me that people were still writting thank you's to all of those that fought and died in the war, more specifically, how many of them there were. It really quite impressive. I got a set of post cards from there. But I don't think I ever appreciated how much of an effect the Korean War had on the country. There are memorials everywhere and they are huge! Then we went to lunch, Lunch was really good, I didn't ask what half of it was, but I didn't really care. It was all amazing. We had pork today and I told Dr. Vartanian to "eat the fat" literally. I saw him picking off the fat from the meat and the fat had so much flavor. It was amazing! Besides, the food critics said to eat it. Finally, we went to some sort of salt mine. It was a facinating place and very pretty. I think it was a marsh. But it was cool! We even got to help put more water into the actually mining operation. Yes, they pull the salt from the water in the marsh. Cool right? The scenery was pretty. It looked like a good place to film a movie. Before we went to IFEZ, we went to E-mart! It's basically the Korean Walmart. It was awesome! 3 floors of shopping at great prices on everything but clothes. I got my chopsticks, spoon set! I'm very excited about that! IFEZ stands for the International Free Economic Zone which I must say is an ingenious idea. I was astounded by the concept. Basically they give countries their own district and they don't pay for the land. Then they can build shops, etc to sell to the Korean people. It's an awesome plan! They are building constantly and it should be amazing when completed! I hope I get to come back and see it when it's done. Oh and China town is the district owned by the Chinese. Haha! Imagine that. Then we went to dinner and I will have to just show you videos from dinner. It was alive! Okay, not all of it. But We went to the seafood market and I did't know if I should get hungry or feel really bad for the fish. I mean they even had live sharks swimming around for sale. It was definately an unforgettable experience for me. I really didn't even know what to think while we were there, but it made me miss my fish! But not enough to want them here with me. They can stay home, safe from all the fishmen. We bought some hagfish and some other things I wasn't sure what they were. It was facinating to see what all they eat. 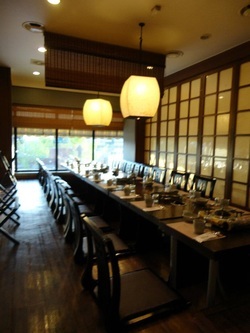 After our shopping in the seafood market we headed to a near by store with a dinning room. We went upstairs and they brought us fanta, coke, sprite, soju, and mul-gok. 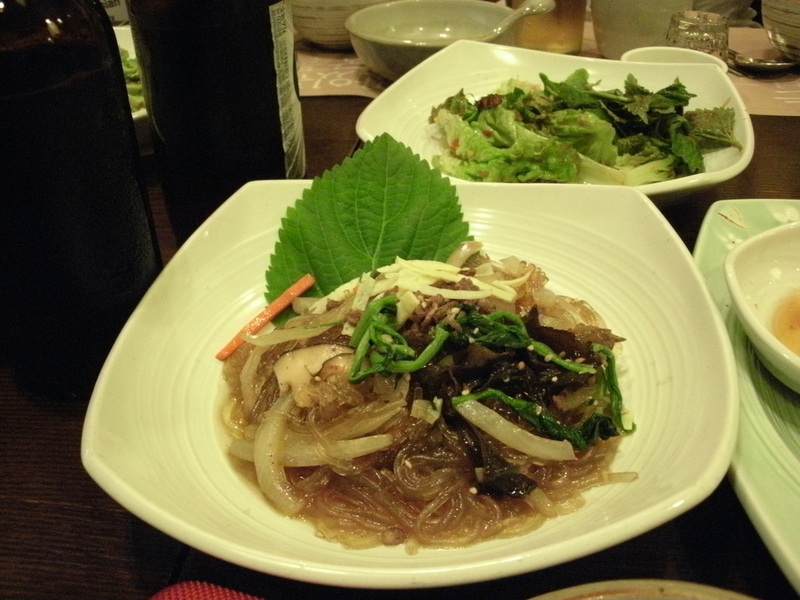 Soju is kinda like sake and mul-gok is a rice wine. Mr. Choi made me a mixed shot of soju and sprite which was pretty good, then I realized that the first taste of it I had was mostly sprite. So I fixed the problem by adding more sprite and mixing before each sip. Then I got a second glass and filled that one with sprite. 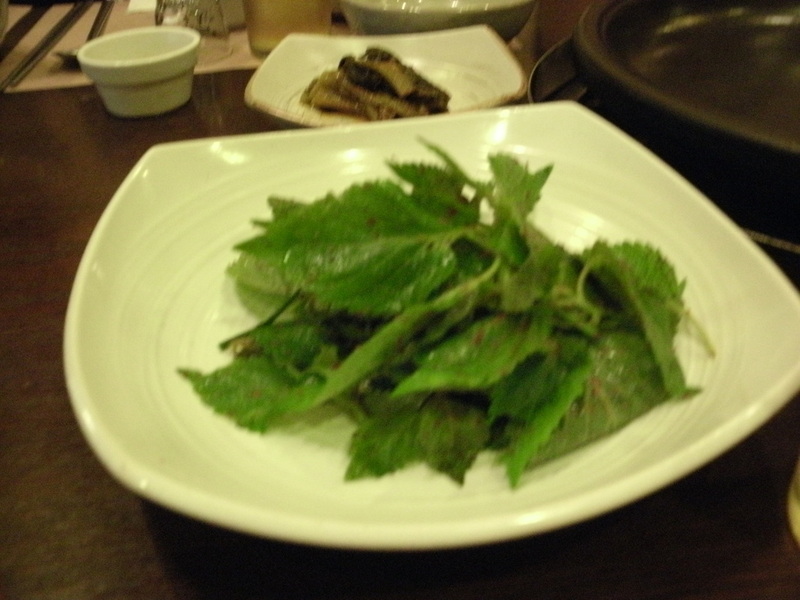 After finish the soju, I of course have to try the mul-gok. 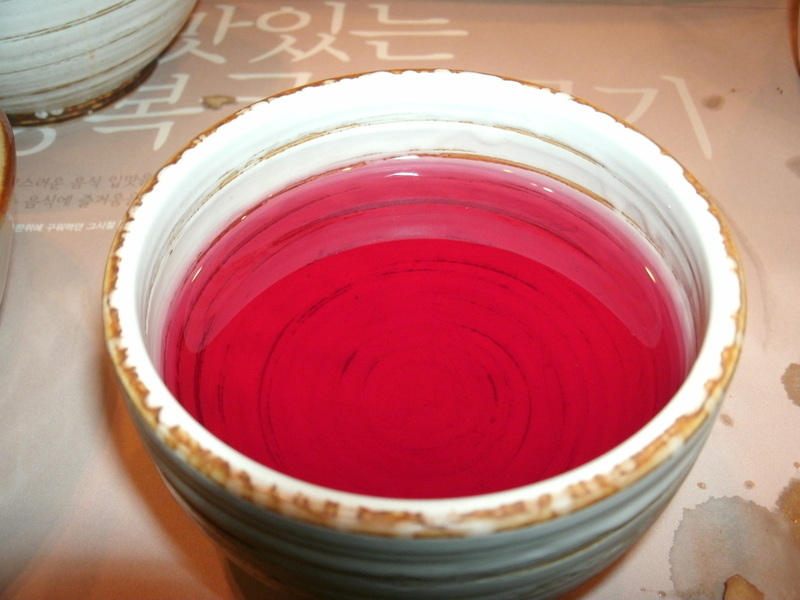 It's the classic drink of the Korean people. That tasted kinda fruity. Strange stuff. So those were my two shots of the night. I didn't really want to go over that so I kept drinking sprite and eating awesome seafood. So what did we eat? Well I'm glad you asked. We had oysters, clams, etc all cooked on the grill in front of us and since I was sitting next to Ms. Sung, Min-ju and Jini (I probably just killed that spelling), they cooked and explained how I should properly eat things. Which I think my tastebuds are being numbed to spice as they put a bunch of wasabi in my soy-sauce and told me to mix it and I didn't even taste the difference. But the mollusks were all very good. Then they brought out some cooked fish and some raw fish. I don't know what kind of fish it was, but I wasn't big on the raw fish. Very strange for me. Cool thing is, Mr. Choi treated us to some octopus. Ashlin and I were very excited about it and she mentioned it to him since she was up by him. I tell you what, Mr. Choi is awesome! 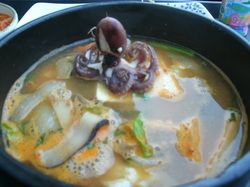 That octopus was amazing! It was still moving but it was really awesome! 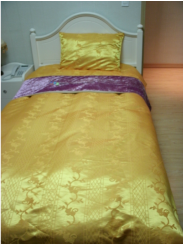 It was SO light and soft! YUM!!!!!!! The hagfish was okay, I probably won't eat it again though. Very chewy. 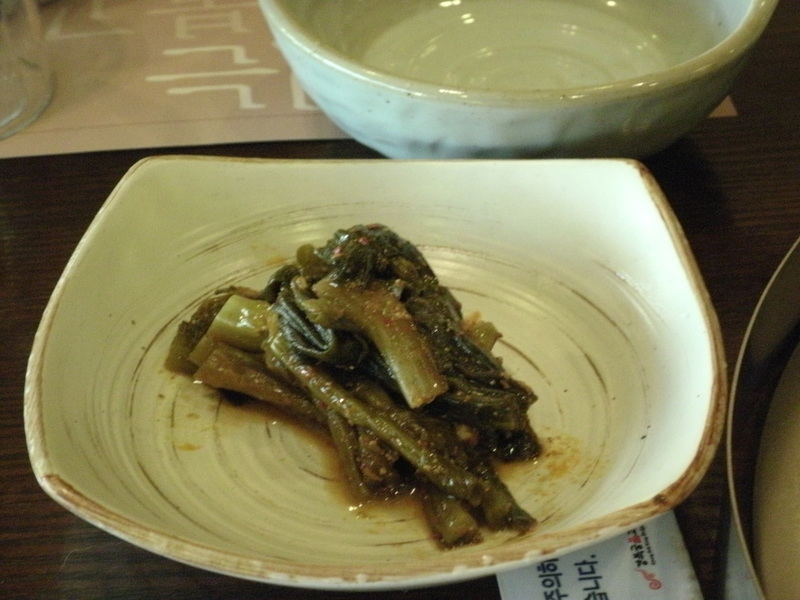 Then, of course, as in Korean style, they brought us another dish! It was a seafood noodle bowl with clams and it was really good and I was so sad when I was too full to eat it.